The HKUST Jockey Club Institute for Advanced Study (IAS) has succeeded in securing government seed funding and support for capital construction as well as funding support from The Hong Kong Jockey Club. 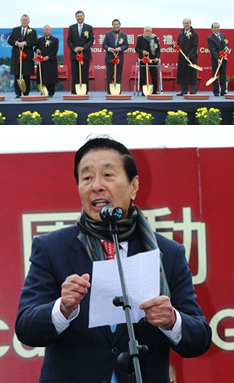 In addition, IAS received enthusiastic support from the community, with Dr Lee Shau Kee being its Founding Patron and donations and pledges received from Dr Larry Yung, Lo Ka Chung Charitable Foundation, Dr Helmut Sohmen and Prof Anna Pao Sohmen, Ting Tsung & Wei Fong Chao Global Foundation, Si Yuan Foundation, The Bank of East Asia Limited, Lam Woo Foundation Limited, HK JEBN Limited, Sin Wai Kin Foundation Limited, Tin Ka Ping Foundation, and UC RUSAL. HKUST is pursuing its biggest fundraising campaign to establish an Endowment Fund for IAS. Income generated from the Endowment Fund will be used to support the operation of the IAS and sustain its development. The IAS is recruiting 10 "star scholars" as permanent Institute Faculty Members. We will honor each with a named professorship (an endowment of HK$30 million each), which provides salary enhancement and additional research funding. Also, we will set up 60 named fellowships (an endowment of HK$10 million each) for young and promising scholars who join IAS as postdoctoral fellows to work closely with the permanent Institute Faculty. If you wish to discuss your gift or obtain more information on giving to IAS, please contact the following staff of the University’s Development and Alumni Office.